Whilst the shortbread is cooking, start making the caramel layer by combining all the condensed milk, sugar and butter in a large saucepan. Cook over a medium heat , stirring all the time so it doesn’t burn on the bottom, until it turns a dark golden brown and thickens slightly, 5-7 mins. Stir in the salt and pour over the shortbread base. 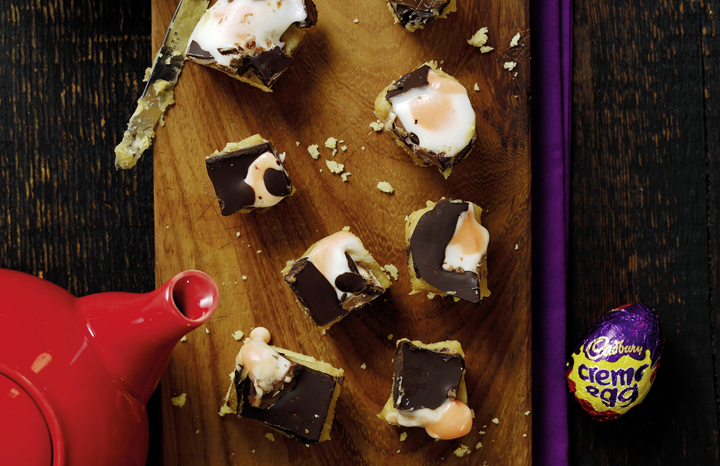 Use a sharp knife to cut the crème eggs in half, and then arrange the creme egg halves over the caramel. Press them in gently, leaving about 1cm sticking out of the caramel. Leave to set for at least 1 hr.